THE SHANGHAI COBRA, 1945. Original Belgian Movie Poster (14″ x 19” / 46 x 62 cm). 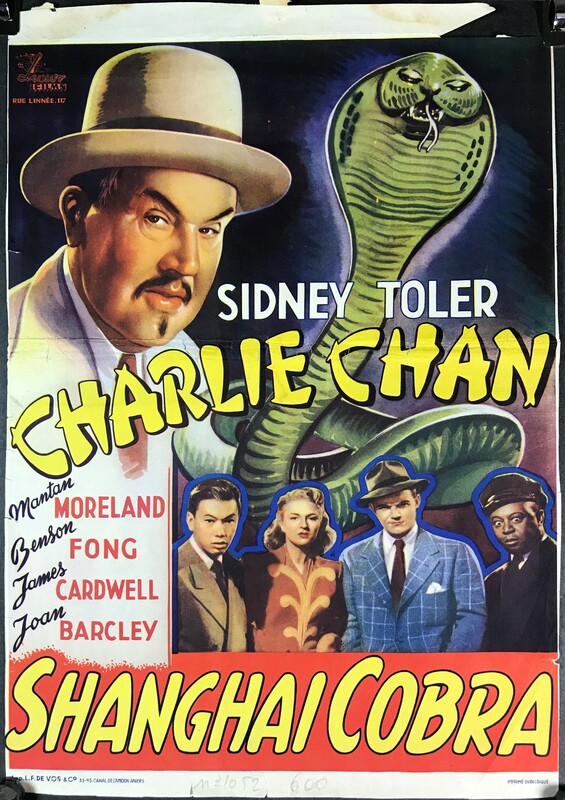 Starring starring Sidney Toler, Mantan Moreland, Benson Fong, Joan Barcley and James Cardwell. Directed by Phil Karlson and produced by James C. Burkett. When a successful banker in New York City is murdered by cobra venom, Charlie Chan is called in to investigate. Arriving in Manhattan with his #3 son, Tommy, and chauffeur, Birmingham Brown, Chan is drawn into a twisted plan involving a secret stash of radium hidden in the bank. Chan connects the crime to an eerily similar case he worked in Shanghai many years before. Using his signature cunning detective skills, he cracks the case, rescues his bumbling companions, and has the real killer arrested. “Buy This Poster” button adds a $10 base charge for shipping a folded, rolled or not linen backed poster in the USA. If outside the USA, please select the appropriate surcharge to your cart. If you do not see your location please <CONTACT US> and we will provide a shipping quote. We combine shipping.